This story goes back to the proverbial wisdom of ‘if life gives you a lemon, make a lemonade out of it..’ Goonj innovatively turned a potential problem of used flex banners, on its head by creatively using this waste to address the challenges of people we work with. Banners are a necessary evil and despite being a nuisance in terms of disposal, they are a part and parcel of our urban landscape. Most banners are made of what we commonly call flex (poly-vinyl chloride), a material similar to plastic. Its durability and cost effectiveness makes it the preferred material for display. But like plastic, flex is harmful for the environment because it is non biodegradable. However, recycling the banners and adapting the flex for alternative uses, enhances its utility in diverse ways and goes a long way in reducing its harmful effect on the environment. 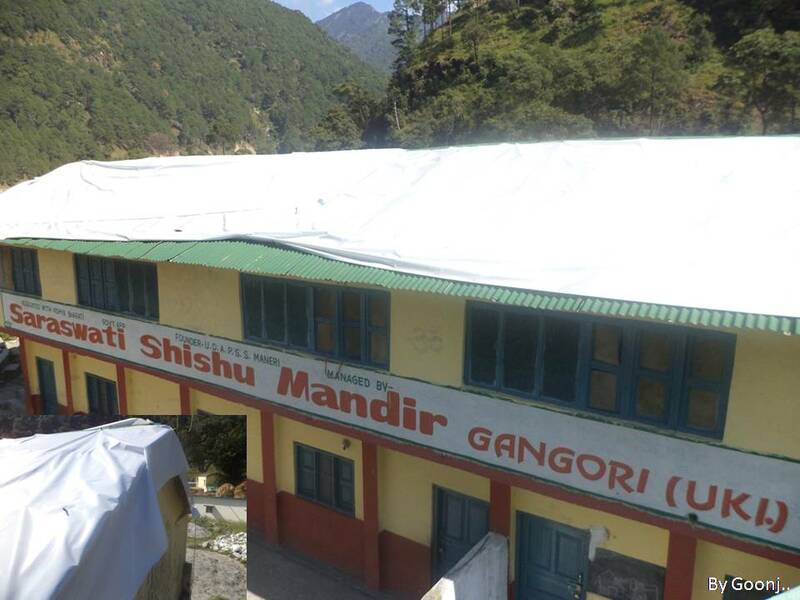 In 2013, a large roll of used flex we had received was utilized to cover a leaky roof of Achrumal Saraswati Shishu Mandir School, situated in the interiors of Gangori in Uttarkashi, Uttarakhand. The flex cover lasted for an entire year and it saved the school from constant worry about repairs and monsoons. Similarly, flex pieces were sent to various villages in Uttron and Nald (in Uttarakhand) when needed. During the Uttarakhand floods (2013), flex was used to cover the tin-roofs of shanties and floors of flood-relief centers to protect against the extreme moisture and cold. In some Goonj flood relief centres, flex is still used to protect against the severe cold and to make the cleaning of floors that much easier. Over the years we found flex to be of utility in other products as well. “We needed to buy a lot of buckram cloth to ensure stiffness in making many of our bags etc. One day I experimented with flex and used it instead of buckram as a base for making a men’s wallet. It worked beautifully,” says Reena, working on ‘Green by Goonj’ products at our Delhi workshop. She adds, “Gradually we started using flex in many of our ‘Green by Goonj’ products. It has definitely made our products more durable.” In areas where there is an absence of direct sunlight, flex has been very useful in protecting buildings from moisture. This in turn has helped safeguard stocks of material stored in buildings across the country. After the 2008 Bihar floods, various stitching centres were set up by Goonj using local resources such as bamboo and by renovating abandoned structures under Goonj’s ‘Cloth for Work ‘(CFW ) initiative. Flex was used extensively for roofing and covering the walls of these centres. Over the years, these centres have provided livelihood to many women in the neighbouring villages. Many of the 750 girls and women who got training at the Keshopur centre, (Madhepura, Bihar) have gone on to purchase sewing machines and set up their own small shops. At many Goonj Chehak centres (informal learning spaces), flex is also replacing expensive tarpaulins. In schools, where students were once forced to sit on tattered mats and daris, flex is adding a layer for comfort. Recently we found a new usage of the flex. It is now addressing a much needed but neglected need for women who have very little to manage their menstruation. Flex pieces are turned into pouches, given along with Goonj’s ‘MY Pads’ (cloth sanitary pads) to women in far flung villages. For menstruating women who spend the entire day at work and do not have a place to store their used cloth pads (to wash and reuse later), this little pouch is not only leak-proof but also ensures repeated use of these cloth pads. From roofs of makeshift shanties, to wallets and pouches for sanitary pads; finding alternative uses of flex has undoubtedly been a big step in the right direction.